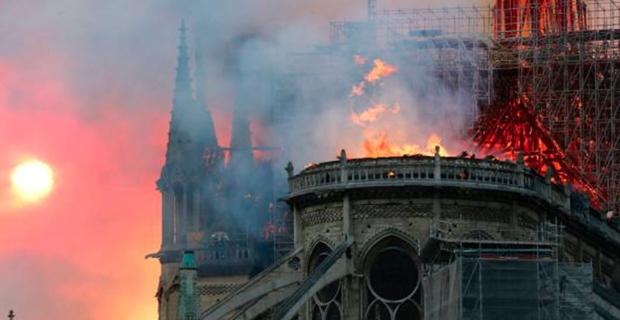 A fire has broken out at the famous Notre‑Dame cathedral in Paris and has spread rapidly across the building. A major operation to tackle the blaze is underway at the 850‑year‑old Gothic building, but the cathedral's spire and roof have collapsed. Macron has cancelled his planned speech to the nation following the fire. Historian Camille Pascal told French media that the fire was destroying "invaluable heritage." Pascal said that no other site represents France quite like Notre‑Dame. Its main rival as a national symbol, the Eiffel Tower, is little more than a century old. Notre‑Dame has stood tall above Paris since the 1200s. It has given its name to one of the country's literary masterpieces. Victor Hugo's The Hunchback of Notre‑Dame is known to the French simply as Notre Dame de Paris.